Paley DocPitch Competition 2018: Be "In the Room"! 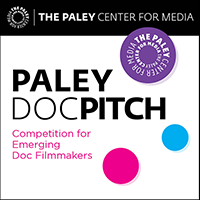 | The Paley Center for Media Paley DocPitch Competition 2018: Be "In the Room"! Finding Yingying by Jiayan "Jenny" Shi — WINNER! How do you sell a documentary? Watch and learn as five preselected up-and-coming nonfiction filmmakers pitch their ideas before a live audience and a group of eminent documentarians. The panel of experts will evaluate the proposals for uniqueness and viability, as well as offering the emerging filmmaker helpful feedback. The winner will be awarded a $5,000 grant from A&E IndieFilms to be used toward the completion of the pitched film. The audience will learn valuable lessons in communicating ideas and will also get to cast its vote. Past winners of this contest, now in its fourteenth year, include the acclaimed films The Age of Love, Circo, and Herman’s House. The Paley Center thanks Hearst for supporting Paley DocPitch and other documentary programs. Ticket includes a post-event reception with drinks and snacks. Tickets are FREE for Paley Members. RSVP now. Public purchase tickets below.